Warmer temperatures have increased extreme weather events in their frequency, severity, and longevity. Warmer air holds more water and circulates more vigorously than cooler air, both of which factors are conducive to creating storms. There is evidence that the past few decades have seen an increase in extreme weather. For example, insurance companies now pay 15 times more money to the victims of extreme weather than they did three decades ago. The total economic losses, including those that are noninsured, are also far greater. One major reason for the enormous increase in economic losses is that there is much more development to which losses can occur, particularly near coastlines. The deadliest weather phenomena are heat waves, which have increased in frequency and duration in recent years. A heat wave is a prolonged period of excessively hot weather, relative to what is expected for that location. In temperate zones, a heat wave is considered to be at least three consecutive days of 86°F (30°C) weather, but in warmer regions much hotter temperatures are required. Despite the prevalence of heating and air conditioning to moderate indoor climate in the developed world, temperature extremes still sometimes lead to lethal results. Health is most impacted when nighttime temperatures remain high, and the heat does not subside for days. 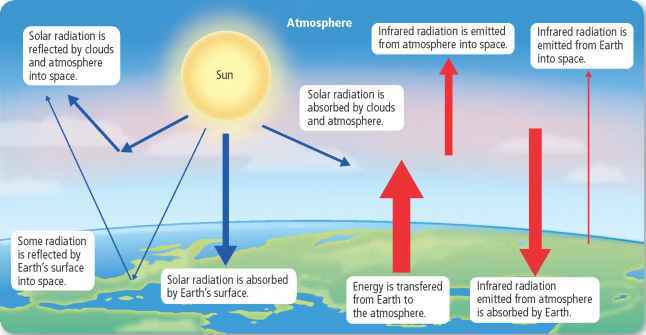 The increase in pollutants in the stagnant air further contributes to the problem of high temperatures. High heat is also more damaging when coupled with high humidity. The summer of 2003 in Europe was the hottest since 1500. Estimates are that around 26,000 people—nearly 15,000 in France alone—died of heat-related problems. The total cost of the disaster was estimated at $13.5 billion. A region is considered to be in a drought if it has had a shortage of rainfall for days, weeks, seasons, or years when compared with how much rain usually falls. Drought is also related to the effectiveness of the rain. For example, if a drought-stricken region receives its entire annual rainfall in one quick storm, the water runs off the land before it can soak into the soil and provide moisture for plants, and the area remains in drought. The National Center for Atmospheric Research in Boulder, Colorado, reports that about 30% of the world's lands are now stricken by drought, double from the percentage in the 1970s. The southwestern United States has been experiencing drought conditions since 1998. 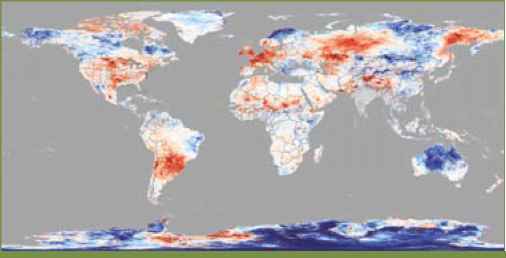 While warming has parched some regions, others have experienced increased flooding. There were 10 times as many catastrophic floods between 1990 and 2000 globally than in an average decade between 1950 and 1985. The number of people affected by floods worldwide has risen to 150 million from 7 million in the 1960s. The increase has mostly taken place on the world's largest rivers. The 1993 Mississippi River flood was the most damaging in United States history due to recent develop--ment along the river. The river basin received between two and six times the normal amount of rainfall—so much rain that the ground became too saturated to absorb more water, and local streams began to overflow. As many as 150 levees, protecting over 6,000 miles (9,300 km) of the Mississippi and its tributaries, failed. However, not all levees broke, and low--lying areas in Davenport, Iowa; Rock Island, Illinois; and Hannibal, Missouri, among others, were saved. 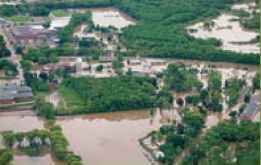 At least some of the extreme flooding was caused by the 80% loss of Mississippi River basin wetlands, which once acted as natural floodwater storage. The costliest and most visible change in weather-related disasters in the United States is the increase in the number of intense hurricanes making landfall from the Atlantic basin. Similar increases are also occurring in the Pacific basin. Hurricanes are born in summer and autumn when a vast area of the sea surface rises to 82°F (28°C) or higher, and winds are light. The warm seawater heats the air above it, causing the air to rise. The column of air spirals upward, feeding on the heat energy from the tropical waters. For the storm to grow, there must be little or no wind shear between the lower and upper atmosphere; high wind shear will decapitate the storm. , x , „ residences; major erosion of 4 (very strong) 131-156 210-251 , , . , . water a day. Hurricanes typically last 5 to 10 days but may last up to three weeks. Once these mighty storms are cut off from warm water, they lose strength, so they die fairly quickly over cooler water or land. Damage comes from the impact of these storms on the ocean as well. Category 4 and 5 hurricanes can generate storm surges of 20 to 25 feet (7.0 to 7.6 m) for a distance of 50 to 100 miles (80 to 160 km) along a coastline. Giant waves, up to 50 feet (15 m) high, ride atop storm surges and cause even greater damage. In areas of low elevation—as is typical of the Atlantic and Gulf Coasts of the United States, which rise less than 10 feet (3 m) above sea level—flooding may be devastating. A typical Atlantic season spawns six hurricanes and many smaller tropical storms. On average, one hurricane strikes the United States coastline three times in every five years (that is, there is a 60% chance of a hurricane striking the coastline in any given year). But few hur--ricane seasons are typical. A cycle of high activity from the 1920s through the 1960s was followed by low activity between 1971 and 1994. Nevertheless, major storms can form during quiet periods, as was shown when Hurricane Andrew devastated South Florida in 1992. Since 1995, conditions have become much more favorable for hurricane growth. Between 1995 and 2000, hurricanes formed at a rate twice as great as during the most recent quiet period, and the Caribbean experienced a fivefold increase. Some hurricane experts attribute variations in storm number to natural climate variation, such as the Atlantic Multidecadal Oscillation (AMO), rather than to global warming. Still, many experts blame global warming for other changes in hurricanes. 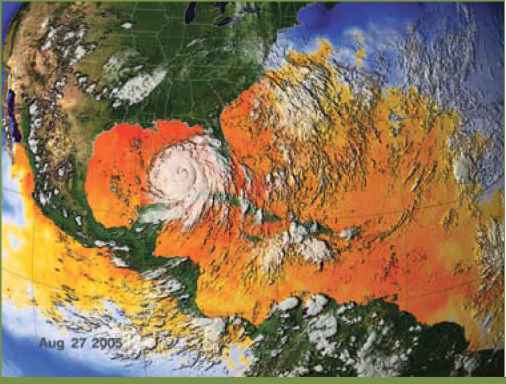 A 2005 study in the journal Nature, by Kerry Emanuel of the Massachusetts Institute of Technology, shows that hurricanes have increased in duration and intensity by about 50% since the 1970s. The number of Category 4 and 5 hurricanes jumped from 50 per five years during the 1970s to 90 per five years since 1995. The jump was even higher in the North Atlantic, from 16 strong hurricanes between 1975 and 1989 to 26 between 1990 and 2004.
temperature have intense storms. Rising temperatures also cause these mammoth storms to last longer. These effects of increased storm intensity and duration are predicted by computer models of rising SST. 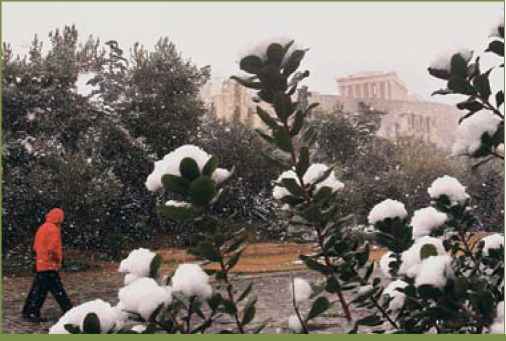 A study by Kevin Trenberth and Dennis Shea of the National Center for Atmospheric Research, in Boulder, Colorado, published in Geophysical Research Letters in 2006, analyzed the reasons the 2005 season was so unusual. It suggests that global warming played the biggest role, with a smaller effect from a Pacific El Niño and a still smaller effect from the AMO. Climate scientists will likely be debating the relative impacts of global warming and other factors regarding hurricanes for years to come. The United States is not the only location experiencing unusual hurricane activity. In 2004, Japan experienced 10 typhoons, three more than the greatest number ever recorded. Also that year, for the first time, a hurricane formed in the South Atlantic. That storm, called Hurricane Catarina, hit Brazil.